This article contains affiliate links at no cost to you. The Game of Thrones filming locations in Dubrovnik are nothing short of spectacular. The hit TV series is widely known for its remarkable film locations. So we sent Erin Bender of Explore with Erin (nomadic family travel blogger who totally rocks) on a tour so she could bring us the deets. Here’s her story about the GOT tour, Dubrovnik and the excitement of being where this incredible show was filmed. While in Split, Croatia, I managed to sneak a glimpse of the Game of Thrones production team, and even witness some of the filming. I was so disappointed when my husband finally arrived at the scene a few days later, and we found that everyone was gone. Still, all was not lost, and when we heard that Dubrovnik played host to a casting event for the show, we were on our way. Visiting the real backdrop of the world’s most popular TV show was definitely a fairytale event for me. On top of that, I was really looking forward to exploring Dubrovnik further with our local expert from Tours by Locals. Our guide, Tom, found us easily enough at Pile Gate, a popular entrance for tourists. He has been in Dubrovnik for more than 30 years, and aside from being an avid Game of Thrones fan himself, also knew a lot of secrets as well, especially since his sister used to be an extra on the series. Imagine our luck! We knew we’d have an insider’s view not just on the city’s culture and important locations, but also on many intriguing and little-known details linked to the well-known HBO show. We were given photo booklets to compare scenes from Game of Throne with the real thing. We managed to explore a few places within the old city walls, as well as near the nearby fortress – where the entrance was provided by using the old city wall ticket we had purchased the previous day. Of course, you will not find all the scenes from the show here since it’s also filmed in Northern Ireland, Iceland, Morocco, Spain, Scotland, and Malta. But rest assured that you’ll get much more than just a Dubrovnik history lesson, with access to the best filming locations in the area. During the tour, we learned Dubrovnik’s old city walls and Fort Lovrijenac were the main Game of Thrones filming locations in Dubrovnik for scenes such as King Joffrey’s name day and other King’s Landing events. Also, the fortress and the nearby island of Lokrum were the places where scenes from Qarth and Daenerys’ House of the Undying scenes (in Minceta Tower) were filmed. 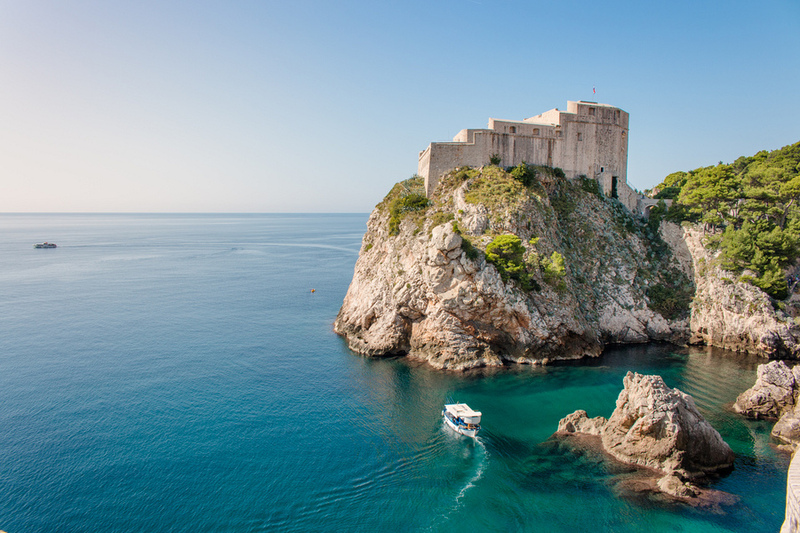 Dubrovnik is nicknamed “King’s Landing,” and for good reason, since you can always find a princely new adventure here. And to that end, after the tour was over Tom led us to a place called Buza Bar – literally a “hole in the wall” café etched into a cliff right above the Adriatic Sea. You’ll find the bar to offer an excellent scenic view of the sea, and aside from the drinks being quite delicious, it’s also a great place for cliff diving. After our little adventure, we reached a small hostel where Peter Dinklage (our own beloved Tyrion Lannister) drank through the night one time with some Australian friends during the 1st season’s filming. The staff found him passed out on the couch next morning, and not knowing who he was, demanded he pay for the night and all the alcohol that had “mysteriously disappeared.” We even found a sign above the couch placed as a fond reminder of that memorable event, and I found myself wishing Peter was still there. There are some other cool Game of Thrones filming locations in Dubrovnik from Season 4 you can visit, including Klis Fortress and Perun – to the North and East of Split, and Diocletian’s Palace within the city itself. Also, there’s Baska Voda and Mosor mountain to the south. If you’re a fan of the TV show you’ll certainly enjoy the exceptional tour exploring the Game of Thrones filming locations in Dubrovnik. And if you’re not, you will definitely become one after exploring all the remarkable filming locations and diving into Dubrovnik’s fascinating history. Erin has been traveling with her husband and two children since May 2012. It’s an open-ended, unplanned, round-the-world trip discovering amazing places for families. They have stayed in hostels and 5 star luxury resorts, traveled on scooters and cruise liners, danced with leprechauns and cuddled tigers. Nothing is out of bounds or out of reach for this remarkable Australian family. Dubrovnik looks like such a wonderful place, and with its medievil charm, no wonder its a great hotspot for movies / shows! What an amazing trip! I am a big Game of Thrones fan and they truly have stunning filming locations. Hello, thank you for such helpful information! How to get Tom’s contact? EVerywhere i go, I hear about Games of Thrones. One day I will have time to check it out. Wow! you are so lucky! The place is wonderful and oh it is Game of Thrones!!!! what a fun adventure! It is so much fun to spot the local landmark from a show. In Vancouver we do that with a lot of shows. The nerd in me LOVES this post haha! Wow! I think just seeing the sites in the clips would be exciting. I am going to add this to my to watch list on Netflix. I have an uncle that loves Game of Thrones. The scenery is beautiful. I love those pictures. I’ve never heard of this place before, which should tell you I’ve never watched the popular Game of Thrones. Your photos are awesome and it seems like a place I need to add to my Places to Visit list! The place is so gorgeous! Wish to visit this place someday. Thanks for sharing dear.